The building of Ma’ale Adumim separated the northern and southern halves of the West Bank. This claim is, at best, extremely misleading. As you can see from this map (and map below), Ma’ale Adumim does not “separate” the northern and southern halves of the West Bank. 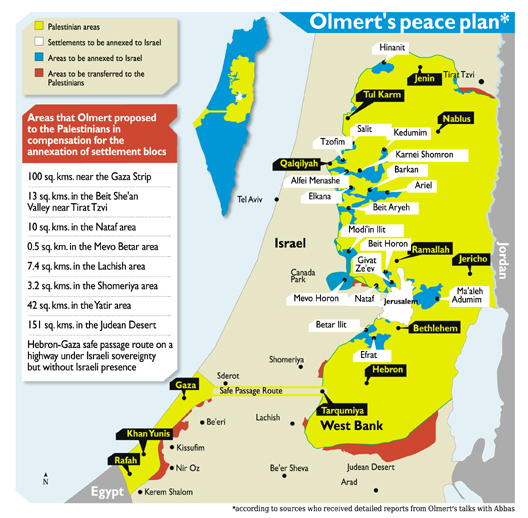 Moreover, the peace plan offered by Ehud Olmert (often characterised as the most generous offer the Palestinians would hope to receive) included Ma’ale Adumim within Israel – as did the map proposed by President Clinton at Camp David in 2000-01. As Condoleezza Rice told Palestinian negotiators in 2009, “I don’t think that any Israeli leader is going to cede Ma’ale Adumim”. To supply them [the settlers] with water, it diverts water from Palestinian communities. According to Amnesty International, the daily allocation for Jewish settlers in the West Bank is 300 litres. Palestinians are forced to survive on as little as 20 litres a day. The claim – suggesting such an egregiously unequal distribution of water – is not true based on research we conducted in 2013 after the Guardian’s Harriet Sherwood made a similar charge. To cite just one refutation of the myth of what some call “water apartheid”, a comprehensive 2012 study, by Prof. Haim Gvirtzman of the Sadat-Begin Center for Strategic Studies, demonstrated that “per capita consumption of water between Israelis and Palestinians…are now negligible.” A fact sheet by COGAT (the Israeli civilian administration in the West Bank) backs up Prof. Gvirtzman’s study, noting that Israelis have only “marginally more” fresh water available than Palestinians. Even the settlers’ sewage is weaponised. According to the Israeli NGO B’Tselem, 5.5m cubic metres of untreated settlement wastewater is dumped into Palestinian valleys and streams each year. This is extremely misleading. First, the untreated settlement wastewater dumped in West Bank “valleys and streams” would naturally impact both Israeli and Palestinian communities in the West Bank. Sewage doesn’t recognize settlement boundaries. However, the more important fact is that Israel is actually a world leader in wastewater treatment and reuse, while Palestinians treat and reuse very little of their waste water. According to a report by COGAT (as cited by Clive Lichpin, director of the Center for Transboundary Water Management at the Arava Institute for Environmental Studies) 82.5% of Palestinian sewage is disposed of into the environment, while Israeli settlements dispose, in that manner, only 12% of their sewage. The “valleys and streams” running through Israeli and Palestinian towns in the West Bank are far more likely to be polluted by “weaponized” Palestinian waste water than by settlement waste water. The “colonialism”, “apartheid” and “ethnic cleansing” smears have been definitively refuted, and it’s risible that anyone would cite Richard Falk – a discredited political extremist who compared Israel to Nazi Germany and was expelled by Human Rights Watch for spreading antisemitism – as an authority on human rights. It is against this backdrop that Netanyahu has become the first serving Israeli prime minister to visit Australia (his visit to New Zealand was cancelled following Wellington’s co-sponsorship of the December’s UN resolution). This is untrue. Though Israel recalled its ambassador from New Zealand after the UN Security Council passed a resolution condemning settlements, Netanyahu was never scheduled to visit the country.